Diamond clarity refers to the absence of inclusions and blemishes in a diamond. Diamonds without these birthmarks are rare. Because diamonds form under immense heat and pressure it is extremely unusual to find a diamond that is without any internal or external inclusions. 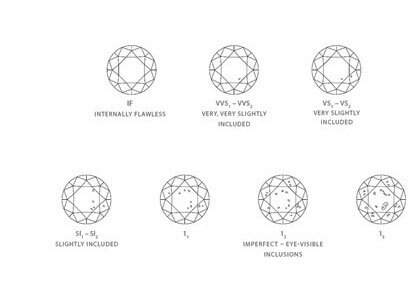 In the internationally recognised Gemological Institute of America system, diamonds are assigned a clarity grade that ranges from flawless (FL) to diamonds with obvious inclusions (I3). To the naked eye diamonds may often seem to be white or colourless, however white diamonds are extremely rare. Diamonds to some degree have a faint yellow tint, which is a result of trace elements that combined with the diamond during its formation. 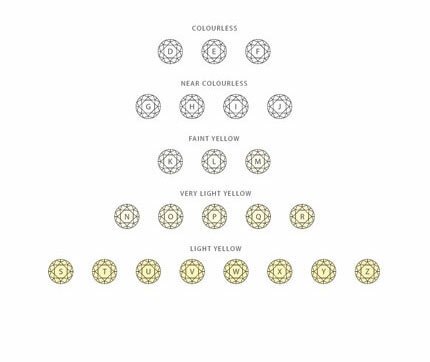 Each diamond’s colour is graded using the internationally recognised Gemological Institute of America System. Diamonds can naturally have fluorescence and emit a visible light when exposed to ultra violet radiation, however fluorescence is not a factor in determining colour or clarity grades. If fluorescence is present a description of its strength and colour will be provided on the diamond’s certificate. A polished diamond’s beauty lies in its relationship with light, how much light enters a diamond and how the light is returned to the eye. The quality of a diamond’s cut is a large factor in whether it is bright and has fire which affects the over all beauty of the diamond. The diamond cut scale ranges from excellent to poor measuring the quality of the cutting, polish and proportions. Diamonds and other gemstones are weighed in metric carats; one carat is equal to 0.2 grams. Just as there are 100 pennies to the pound there are 100 points to the carat, for example 0.50 points of a diamond weighs 0.50 carats. The bigger the diamond the more rare it is, so the larger the diamond the higher it is in value, two 1 carat diamonds will be less valuable than one 2 carat diamond. Two diamonds of the same weight are not necessarily the same price as the value also depends on the clarity, cut and colour.